The Teach Intervals Course is especially designed to give you the teaching techniques for “What, Where and Why Intervals” questions. The Teach Intervals Course includes 6 video sessions: two for each level of Basic, Intermediate and Advanced Rudiments, plus all your downloadable worksheets with examples and exercises. This Unique Music Theory Teacher Training Course is just for you. What will you learn in the Teach Intervals Course? You will learn the 9 mnemonics devices for better memory in learning intervals for Basic, Intermediate and Advanced Rudiments PLUS the What, Where and Why Secrets Revealed. WHAT is an interval? The one thing you can do to instantly communicate intervals. WHERE do you begin to identify an interval? The 3 Simple Steps that work every time! WHY is an interval Major, minor or Perfect? Just because I said so… is not the final answer. “Secret Salute” for placement of accidentals. WHAT is an Aug or dim interval? You will learn 3 more of the 9 Mnemonic devices for better memory. WHERE do you begin to identify an interval? Opening the Circle of Fifths and why it MUST be done that way. WHY does an interval inversion = 9? You will learn the Karate Chop Method of identifying intervals. “Secret Side-by-Side” rule for accidentals. WHAT is a Compound interval? The one thing you can do to instantly connect intervals to melody. WHERE do you begin to identify an inversion? Top note, bottom note or does it really matter? WHY does a dim 5 sound like an Aug 4? “Secret Square System” for interval identification. 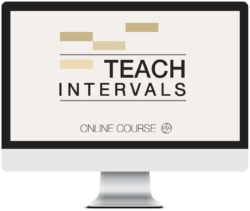 Your Professional Development and Teaching Success continues with the Teach Intervals Course. Teach Intervals Course – What, Where and Why Secrets Revealed – The Way to Score Success!